"Leonardo Da Vinci for our Times"
The ‘International Calligraphy Workshop’ pays tribute to the genius of Leonardo da Vinci and to his own unmistakable calligraphy, as Italy commemorates the 500th Anniversary of the great master’s death. The workshop is being run in collaboration with the Royal Library part of the Royal Museums Turin (Musei Reali Torino), The workshop coincides with the special exhibition held at the Galleria Sabauda “Leonardo da Vinci. Disegnare il futuro” (Designer of the future). The exhibition will include the original self-portrait of Leonardo which is part of the Royal Museums collection. The workshop is presented by TEC in collaboration with calligraphy maestro Massimo Polello in collaboration with TEC (Travel Education and Cultures) and the Musei Reali (Royal Museums Torino). 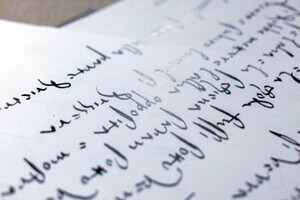 The workshop is structured around a close study of the artistic-expressive evolution of Da Vinci’s handwriting. Forever surrounded by an air of mystery, particularly because of his style of writing upside down and from left to right, Da Vinci’s handwriting can only really be appreciated by seeing it within it’s historical context. Beyond this close study, the workshop’s goal is also to give the participants immediate first-hand experience of how accessible and relevant Leonardo’s cursive handwriting remains today. In addition to the hands-on practice of the workshop, participants will have the privilege of being guests of the Musei Reali Torino and having first-hand access to facsimiles of Leonardo’s codex on flight and manuscripts. The course will end with the binding of an artist’s book that will be produced during the workshop. Morning Workshop: introduction to the calligraphic style of Leonardo da Vinci. Afternoon, Royal Museum: Observation and study of the Facsimile of the Codex on Flight. Morning Workshop: Calligraphic Style of Leonardo. Afternoon, Royal Museum: Observation and study of the Facsimile and/or manuscripts of Leonardo and his contemporaries. Workshop: Breaking the traditional calligraphy techniques: dancing calligraphy. TEC is once again delighted to welcome Massimo to lead a workshop on Leonardo Da Vinci. Massimo is an internationally recognised expert on the calligraphic style Leonardo Da Vinci, having published a collection of essays on the great master. In 2005 he worked on a video for the L’Archivio di Stato di Firenze where he demonstrates the magic of Da Vinci’s writing style, this was used in for the exhibition “Le Lettere di Leonardo” (The Letters of Leonardo). 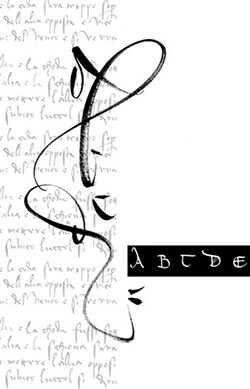 Massimo developed his passion for calligraphy while studying at the Scriptorium de Toulouse. He went on to continue his studies with many other internationally recognised penmen, becoming a master of the traditional calligraphic styles in his own right. From the firm foundations of the traditional style, Massimo has developed his own personal style that pushes the boundaries of the two-dimensional art form to a more fluid shape that also takes form in both time and space. He is also a keep advocate of using technology to push the boundaries of the art form and has achieve some truly unique pieces. Massimo is a full member of the prestigious Letter Exchange Society in London. 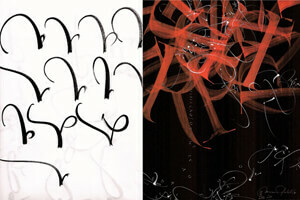 His reputation for being skilled in both traditional and contemporary calligraphy techniques has seen him invited to lead seminars at the School of Visual Arts in New York, Concordia University and UQUAM in Montréal, Canada, and at Adobe in San Francisco. He has been an invited guest at the International Conference of Font Designers in Moscow, Istanbul, and San Paolo, and for the last three years he has also taught at the International Conference of Calligraphy in the USA and Canada. Massimo has exhibited and led workshops, around the world, Recent locations have included Australia, New Zealand, South Korea, South Africa, and Brazil. His work can be found in many important collections, from San Francisco State Library, to Berlin, and Moscow. 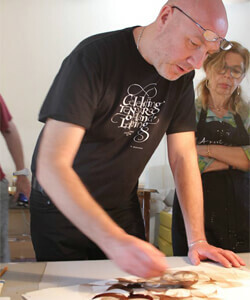 You can find out more about Massimo and his work at his studio ABC Atelier on his website. Torino is the birth-place of modern Italy. In 1861 the various kingdoms, principalities and states that make up Italy were unified in to one kingdom. The first parliament of Italy was hosted in Torino where it remained until the 1870s when it had a brief spell in Florence, before moving to its permanent seat in Rome. However, Torino and the province of Torino in the Region of Piedmont, remained the home to the Italian Royal Family, the House of Savoia. The Savoia royal family greatly influenced the development of Torino from the middle of the 17th Century up until the middle of the 20th Century. During this time they amassed a great collection of art and historical significant pieces. A number of these treasures are on display in the various royal palaces within the local area. 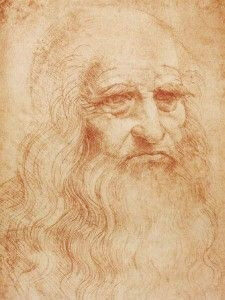 This includes the original self-portrait of Leonardo Da Vinci, and the original Da Vinci codex flight of the bird. To mark the auspicious occasion of the 500th anniversary of the death of Leonardo Da Vinci, TEC is pleased to be collaborating with the Musei Reali Torino to bring a unique perspective to the calligraphic hand of Leonardo. TEC is pleased to have a very close relationship with the Collegio San Giuseppe, and we are pleased to work closely with the college on a number of different activities. 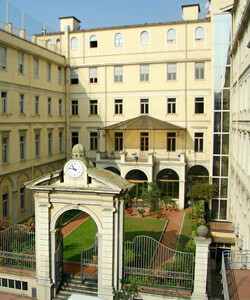 The Collegio is in a magnificent location in the beating heart of the city. Just a short walk from the main station (Torino Porta Nuova) and the many shops, restaurants and bars, museums and palaces that make up this wonderful city. Participants who are staying with TEC during the workshop will be staying on-site in either single or twin bed on-suite rooms. Rooms include breakfast, and the workshop will include lunch at the Collegio. In the evening you will be able to explore more of the city. 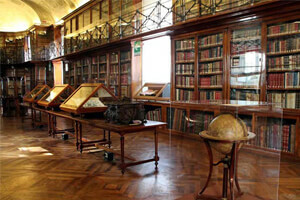 The Royal Library, is a part of the Musei Reali Torino (Royal Museums pf Turin) and is situated in the heart of Torino in the old royal palace. The palace represented the main seat of power for the Savoia family during their reign over the principality of Savoia and later over Italy. 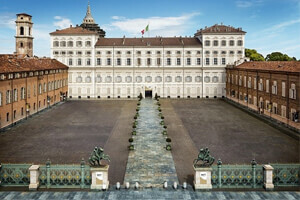 Today, the palace is home to many important artefacts of significant importance to both Italy and the world at large. The Royal Library is home to the only original surviving self-portrait of Leonardo Da Vinci. As well as what is considered by some an original codex of Leonardo’s work on the flight of the bird. It was donated to the House of Savoy by a Russian Renaissance scholar in 1893. The Royal Library (part of the Musei Reali Troino) will play host to two special sessions of our International Calligraphy Course on the Thursday and Friday afternoons. Participants will have the opportunity to view the manuscripts of Da Vinci. Torino is a city with it’s origins in Roman times when it was developed as a trading post. It has seen many periods of rebirth and redevelopment over the years, including as the first capital city of the unified Italy, in 1861. Workshop participants will be able to explore the city in the evenings after the workshop has finished. There are many great places to visit, bars and restaurants that have long history as well as many more contemporary offerings. TEC is delighted to offer this great opportunity to be a part of the cultural celebrations for the remembrance of one of Italy’s greatest contributors to the renaissance and beyond. We are limited to 15 places, once these are filled we will open a waiting list. (*) If you will participate with a friend or partner and would like to share a room we are able to offer twin rooms, the special twin room price is 880€/per person. The rest of the fee must be paid no later than 30th April.